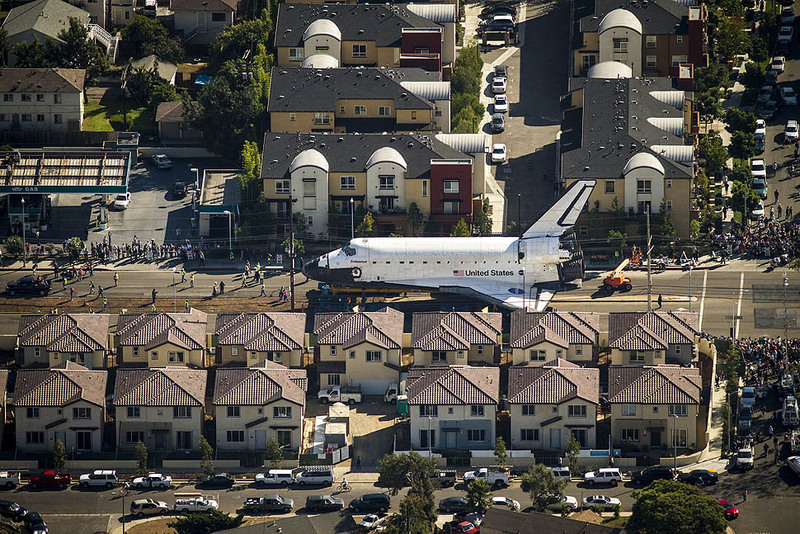 Aerial view of Space Shuttle Endeavour on Manchester Blvd, Los Angeles (Credits: Jay L. Clendenin/Los Angeles Times). A day behind schedule, the retired Space Shuttle Endeavour finally made it to its new home at the California Science Center. The shuttle started its 19 km trip before dawn on October 12 and was supposed to reach its destination the evening of October 13. However, clearance issues and maintenance on the trawler carrying the massive craft created additional delays. “There were times that we were literally inches of clearance, at times the thickness of a credit card,” said the Science Center’s senior vice president William Harris. 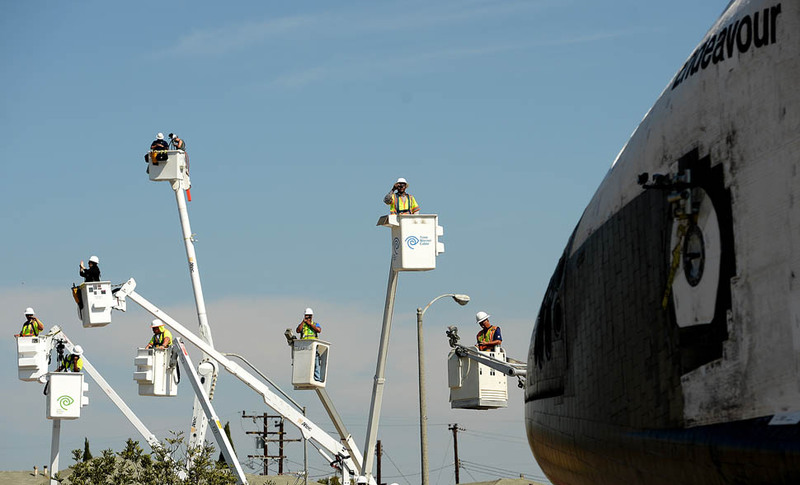 400 trees have been cut down in preparation for the passage of the 5 stories, 23.7 m wide spacecraft down Los Angeles’ residential streets, but additional tree trimming and utility moving was required en route. 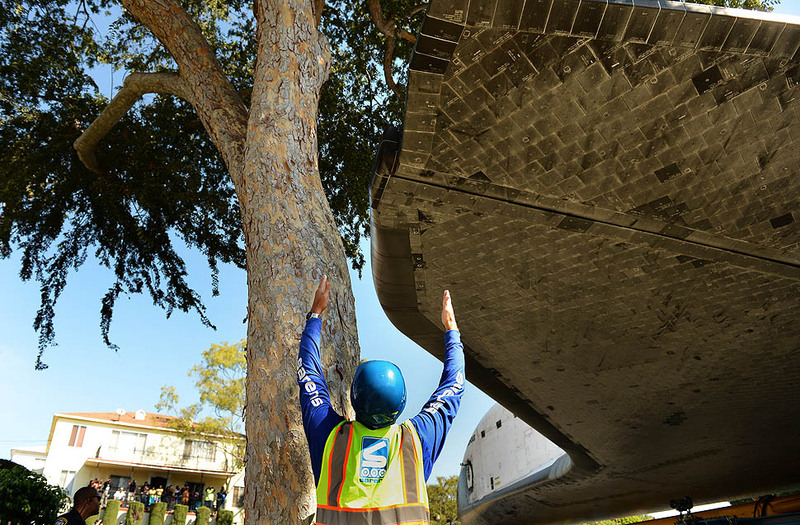 Endeavour’s wing barely clears this tree on Crenshaw Drive (Credits: Los Angeles Times). 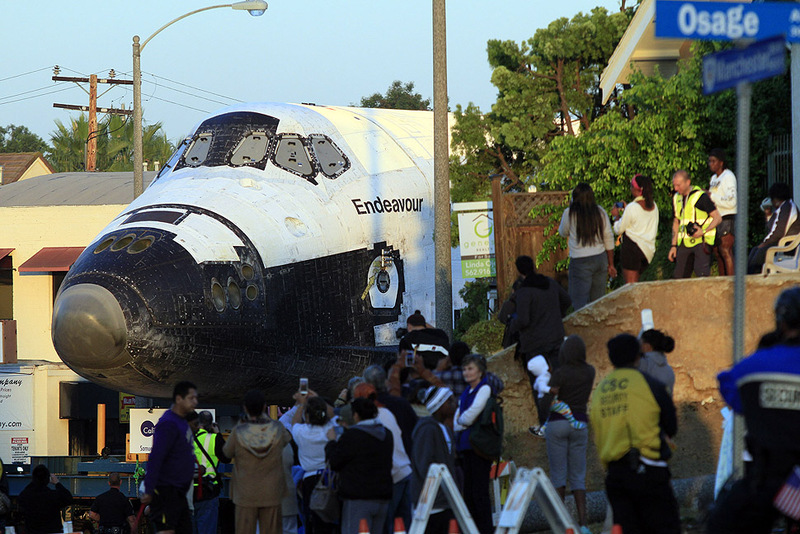 Getting a better view of Endeavour, Crenshaw Drive (Credits: Los Angeles Times). hile most residents were supportive and many thrilled to see the shuttle up close, by Sunday, patience was wearing thin as the slow moving parade continued to block traffic. “I feel like it’s coming back from China. It’s taking so long,” a 9-year-old spectator told the LA Times. 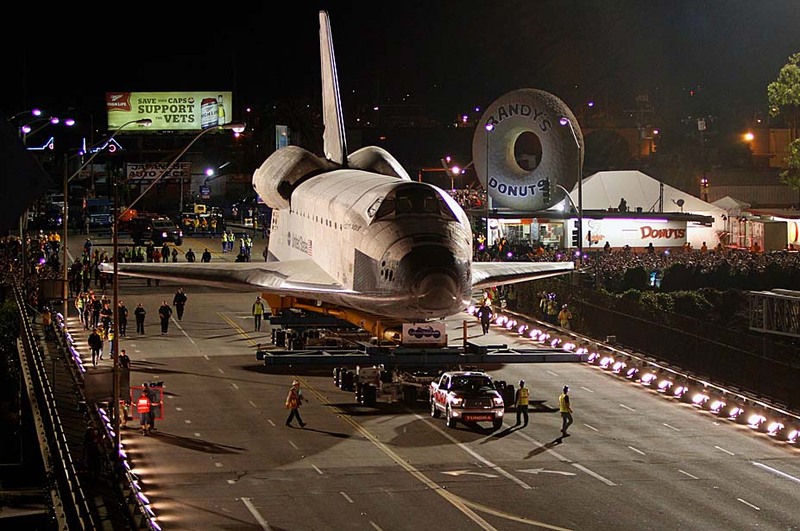 Endeavour finally arrived at its new home at 10:45 AM PST where it can be seen on display starting October 30. The 132 ton Endeavour (and frame) being hauled across freeway 405 by a Toyota tundra pickup truck (Credits: Los Angeles). Endeavour’s nose peaks out Manchester Blvd (Credits: Los Angeles Times).